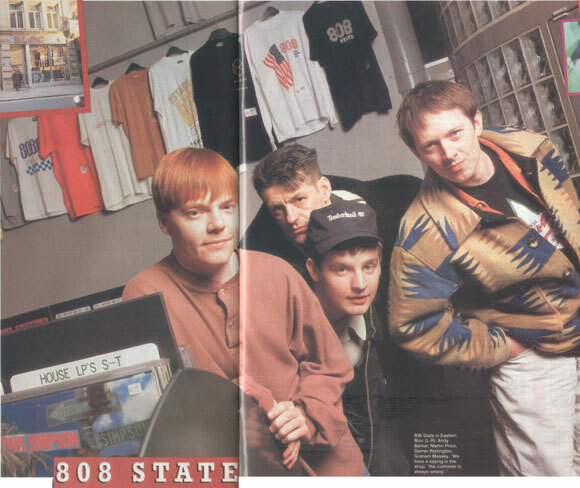 808 State Article: 808 State's Record Shop - Are You Being Served? 808 State's Record Shop - Are You Being Served? This is EASTERN BLOC in Manchester the trendiest record shop in the land! It's where the stars buy their records. And it's owned by Martin Price from 808 State! 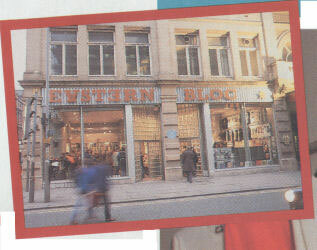 Eastern Bloc is not the sort of record shop you'd go in to purchase Robert Palmer's super new single. That's because it's the most fashionable record store in Manchester - perhaps in the entire of Britain - and it mostly sells hip dance imports from Belgium and indie records from, er, Oldham. It's where all the famous Manchester folk go to get their "music"; people like the Happy Mondays, Ian Brown from The Stone Roses, MC Tunes, that bloke from The Word and - hey! - the drummer from the Inspiral Carpets, to name but a few. It's right in the middle of the city, next to Dry - the pub where the stars tipple till they topple - and Afflecks Palace clothes market - where you can get the latest in swanky "threads" (i.e. T-Shirts with slogans like "Jesus Had Long Hair" on them). And were that not enough, it's even owned by a "pop" star - Martin Price from 808 State! Lots of young ladsters (you hardly get any girls in here) with impractical fringes and irrational trousers go to hang out in Eastern Bloc and listen to the new dance import records from Sweden! Italy! and Holland! which the shop usually gets up to five weeks before anyone else (they were selling D-Shake's 1990 hit "Yaaaah" six months before it charted!). Even the people who work behind the counter are budding celebrities. There are no fewer than 16 records in stock made by former employees! Martin set up his first record shop called Earwig Records in Afflecks Palace five years ago, because "I was scared of having my dole money cut off". Earwig became Eastern Bloc ("It's a terrible name," admits Martin. "I've always hated it.") which moved to the Afflecks arcade below and then to the building it's in now. "I stopped working here when I became a pop star," he quips. 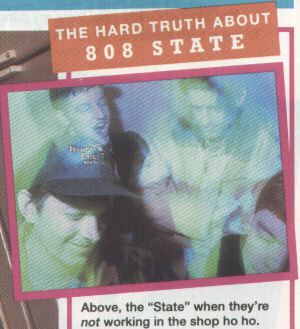 And he recruited the other members of 808 State through the shop. "I met Graham when he was working in a cafe. Darren and Andy used to come into the shop with their tapes. That's how we started." Eastern Bloc is divided into two sections: indie and dance. The dance bit plays really loud house music (so it's a bit like a club) and the indie bit has several hundred T-shirts on the walls (Mondays, Inspirals, Roses, Charlatans etc). Martin says he doesn't go into the indie bit himself. "We have a saying in the shop: 'the customer is always wrong'. It's true. People come in here and they don't know what to buy. A lot of people come in because they don't know how to get in on the scene. You can tell when an out-of-towner comes in immediately. It used to be worse. In the old days if you came in the shop and you didn't know anyone behind the counter you wouldn't get served." Aha. Isn't it a little bit tempting to pretend that you've sold loads of 808 State records and then get to Number One in the charts? "Oh we couldn't do it really," he sighs resignedly. "We'd get found out..."
808 State - Manchester's premiere dance expressionists who eschewed indie music and named themselves after a drum machine - are swinging 35 year old Martin Price, 30 year old Graham Massey and striplings Darren Partington and Andy Barker (both 20). They created the ambient housey seagullness of the "Pacific State" single (early 1990), the wuthered pummelling of the "Cubik" single and now they've got the tremulous "In Yer Face". They also invent all of MC Tunes', er, tunes.Their masterplan is "to make a hell of a lot of money". Oh, and to make "important records, anthems and all that" too.Martin's catchphrase is "giving up food for funk". He adds, "I've starved to have a certain record, spent £8 on one record and not bought any grub." They think they could become the Depeche Mode of the next century. The plaque which announced Earwig Records when it was a stall is now used by Martin as a coffee table. Martin's got odd tattoos which look like biro marks on his left hand. They frequent a chip shop near The Bloc and have promised to give the lady behind the counter (referred to as "the chippy lady") a gold disc. How touching.